In service to my colleagues who have waning patience as they are bombarded with the latest social media sensation, I offer this explanation to the moth with the "tentacles" coming out of its posterior. Here is the circulating image, but there is also a video that is associated with most Facebook posts. Ok, first things first. 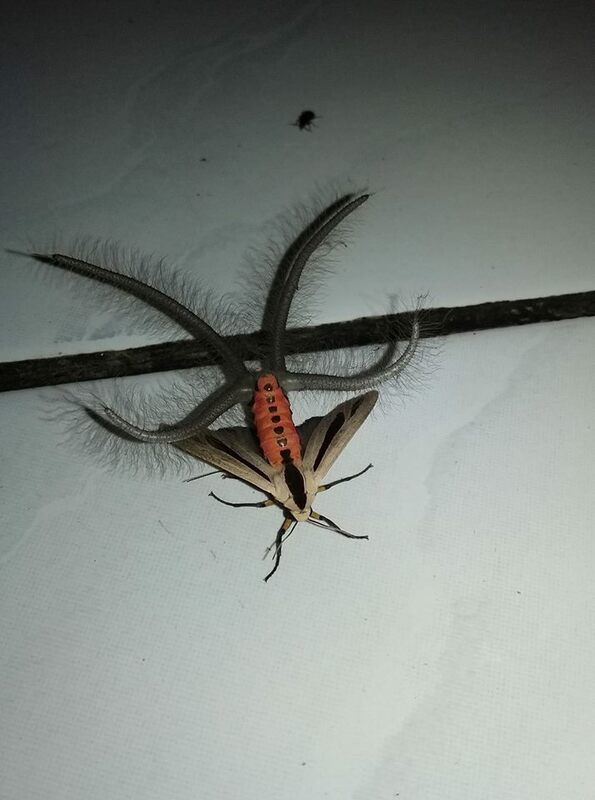 This moth is Creatonotos gangis, an arctiine (tiger) moth from southeast Asia and Australia. The specimen shown is a male. He is everting his androconial glands or coremata (Greek for "feather duster"). The glands are normally concealed within his body, and are inflated at will by air pressure or blood pressure. Less dramatic versions of these organs are known as "hair pencils." Usually concealed within his abdomen, the coremata are deployed when he is seeking acceptance by a mate. As caterpillars, many tiger moths (subfamily Arctiinae of the owlet moth family Erebidae) feed on toxic plants. Milkweed is a good example. The plant is packed full of cardiac glycosides, potent poisons intended to discourage herbivores, including caterpillars, from consuming it. 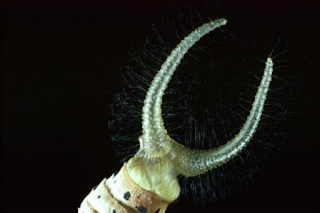 Not only are some caterpillars able to overcome the toxicity, they incorporate it into their own bodies to make themselves toxic to their predators. This is called sequestering, and the commandeered poison stays with the insect throughout metamorphosis and into adulthood. 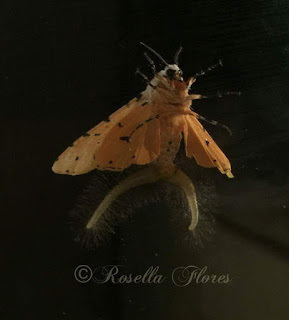 One of the byproducts in male moths is the pheromone emanating from those androconial glands. He thus demonstrates to the female that he is genetically superior based on a greater quantity of accumulated toxins that she can then pass on to her offspring. 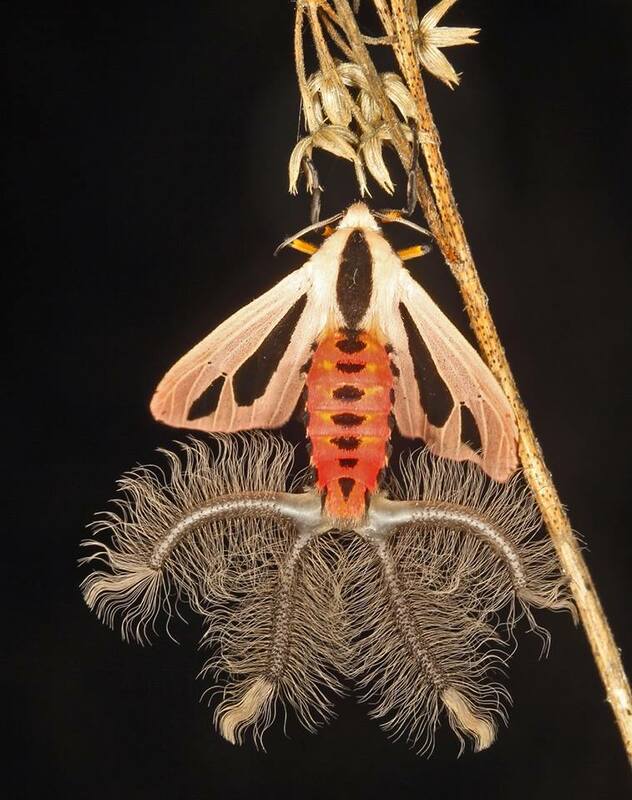 This is a relatively dry explanation of these remarkable structures in male tiger moths. You owe it to yourself to be better entertained and further enlightened by an article in Wired magazine by my good friend and colleague Gwen Pearson. 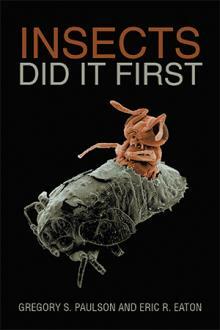 Even the graphics are better, and a GIF has never been funnier, at least in the context of entomology. So, far from "terrifying" as a similar viral graphic was labeled in a headline from Huffpost, these glands are an amazing example of evolution, just like elk antlers and other male adornments. Please share the fascination, without the sensationalism. Thank you. 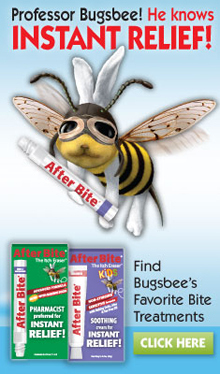 Saving the World One "Bug" at a Time? Increasingly, thanks to social media, I am struck by how many people attempt to save individual insects they find injured or lethargic. On one hand this empathy for other life forms is encouraging, but on the other hand the energy investment is grossly misplaced. The problem is that the media has painted honey bees and Monarch butterflies in particular as highly vulnerable if not on the brink of extinction. The implied message is that every individual of these species needs protection in every way possible! Consequently, people spend more time "rescuing" individual specimens than in protecting or creating habitat, working to curb pesticide use in their community, or engaging in other strategies that would have a far greater impact on improving the health of the entire species. 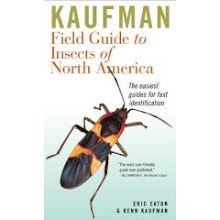 Another problem is that most people are not knowledgeable enough to recognize when a given insect really is in trouble. The wrong assessment happens over and over with bees in particular. Bees often become inactive when it gets too cold for them. They rest on whatever object is available and often this is a more conspicuous spot than normal. A good Samaritan human believes the insect is in peril and needs the equivalent of a sugar-water IV, stat! No, it does not. Further, in late summer and fall, chances are you are saving a male bee, which is even less useful. Male bees live a short life in which their only purpose is to mate with a female. They do not possess pollen baskets, so are less effective pollinators than female bees. Another aspect of life that we forget is that insects, like any organism, are prone to developmental problems that cannot be overcome. 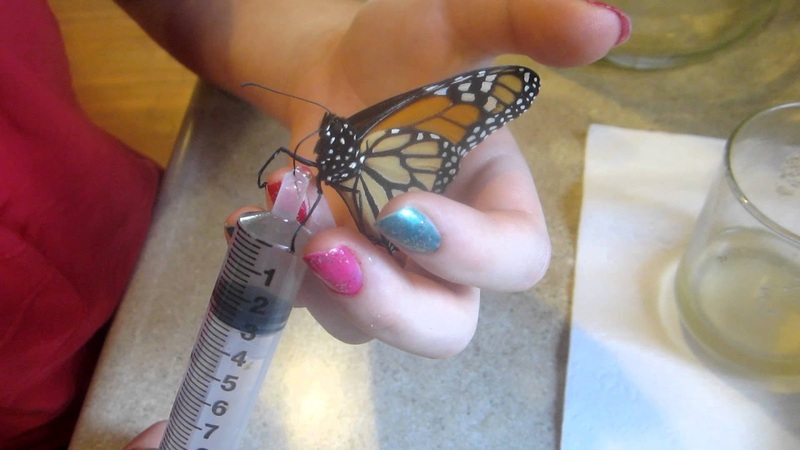 Improper emergence from a chrysalis will leave a butterfly crippled beyond repair. It happens. Insects reproduce in large numbers to overcome those deficits. Insects are incredibly durable once they mature, and losing half a wing barely slows down a butterfly or a bee. We should be in awe as much, if not more, than in sympathy, let alone pity. Ok, so last month my wife and I were on vacation in Cape May, New Jersey, and we happened upon a Monarch trapped in a spider web. We intervened. It was a quick fix, simply disentangling the insect and sending it on its way. The whole investment was maybe forty seconds. We understood the insect could collide with a vehicle later that same day. Our expectations for the survival of individual insects are low, given our knowledge of their biology. Contrast that example with an online video that shows how to mend a broken wing on a Monarch. More than a few such organizations have exploited the "sky is falling" scenarios centered on the Monarch, and one has to question the motives of some of them. Yes, older, established conservation organizations use overly alarming narratives, too, but the best ones measure their tone and can point to historic successes in legislation and habitat protection. You want to curb insect mortality? Then give up driving. For every insect you nurse back to health, you kill dozens, if not hundreds in the course of operating your motor vehicle. Even bicyclists take their toll. I have seen countless insects mortally wounded, or crushed, on bike paths. Basically, insects are better served by actions aimed at enhancing habitat health, and planting native vegetation in the landscape of your own property where you are able. Tear out the lawn, or most of it, and do your best to mimic the natural ecosystem where you live. Want to go a step farther? Start a dialogue with city and county officials to restructure weed ordinances and other codes that currently restrict the ability of homeowners to plant for wildlife. Educate your homeowners association to make those communities more wildlife-friendly without compromising safety and property values. Also, stop insisting that one species is somehow more worthy of our attention than any other. Stop categorizing insects as "friend" or "foe." Such distinctions do not apply to the overwhelming majority of life on this planet. Be proud of yourself for having empathy for other living things; but, channel that into something that will make a difference beyond the individual insect or arachnid. Do intervene for birds, mammals, reptiles, and amphibians, all of which have far longer lifespans than invertebrates, but make sure you do it legally and correctly. Carry on. 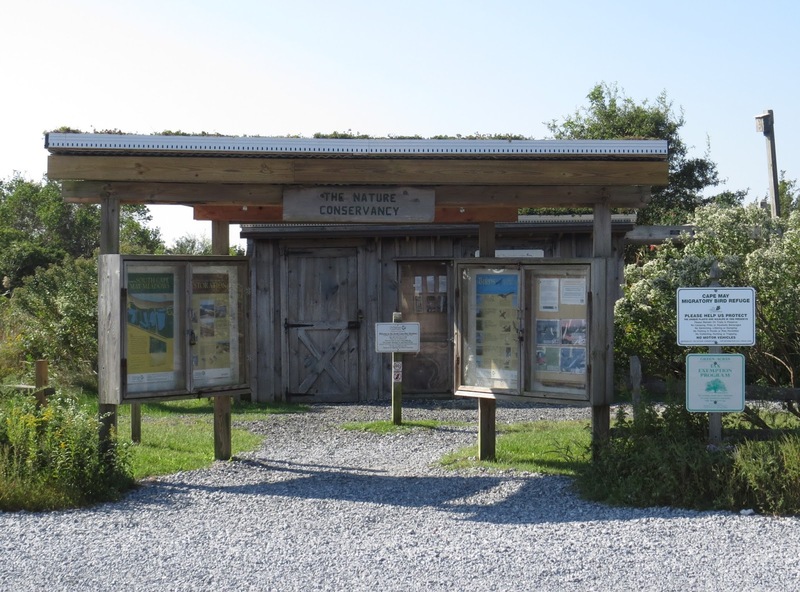 South Cape May Meadows in Cape May, New Jersey is a property managed by The Nature Conservancy (TNC) for birds and other wildlife. 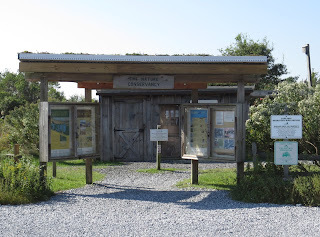 Near the parking lot stands a shed that itself is something of a refuge for a whole community of insects. One wall, facing west and with beams that make something of an overhang or trellis, is being worked over by the Eastern Carpenter Bee, Xylocopa virginica. 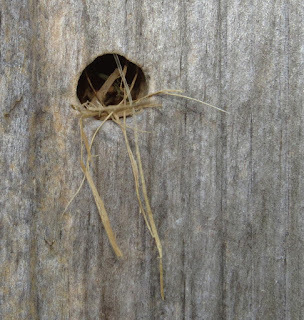 The abandoned nests of these solitary bees are then used by mason wasps, leafcutter bees, and other solitary Hymenoptera. 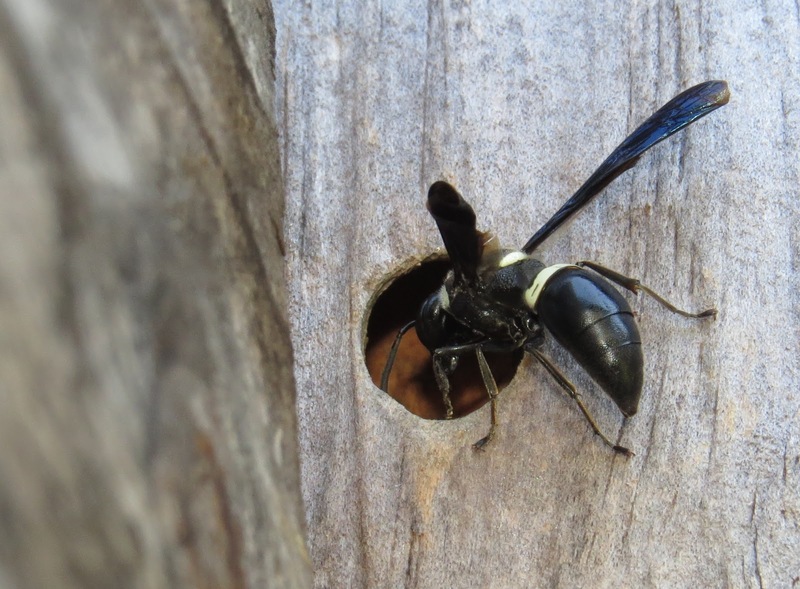 During our visit this past September 24, we noticed the holes, then soon saw females of the Four-toothed Mason Wasp, Monobia quadridens, exploring some of those cavities. I wrote about this species previously, detailing its life cycle, but this was the first time I had observed them coming and going from nests. One female delivered a paralyzed caterpillar during our observations. It was a surprisingly small larva given the size of the wasp, but then she caches several victims in each cell before laying a single egg, putting up a partition of mud, and then starting a new cell along the length of the tunnel inside the wood. 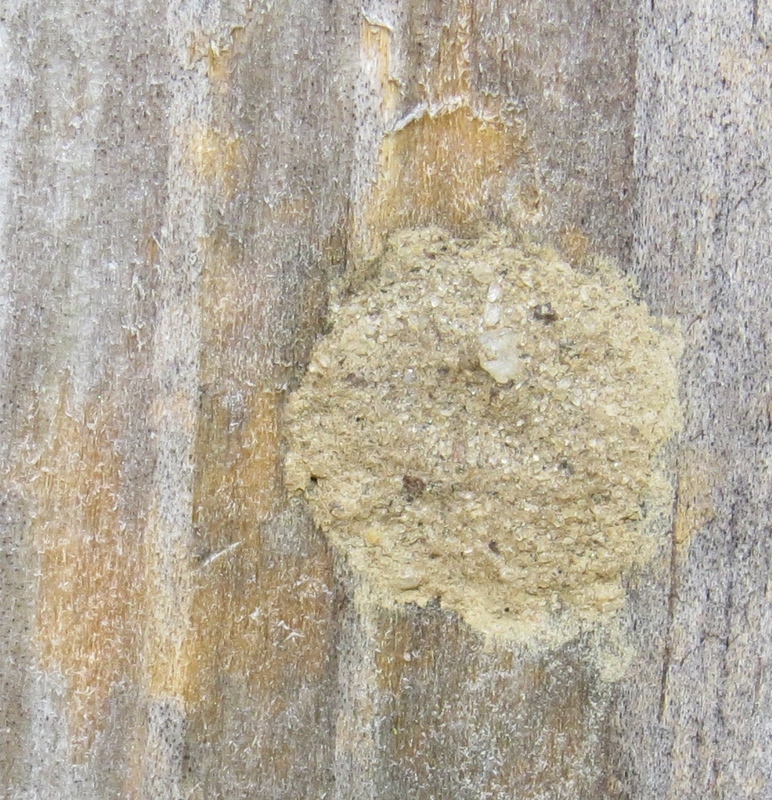 One might think that nests in such solid material would be impermeable to parasites, but not so. 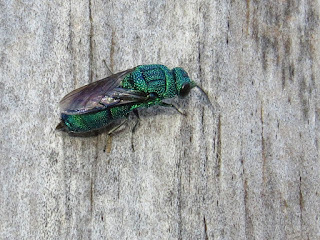 We watched a brilliant blue-green cuckoo wasp, Chrysis sp., investigate some of the holes for occupants. Given a nest in progress, she would infiltrate and lay her own egg inside. Her larva would then consume the prey items left by the rightful owner for its offspring. Cuckoo wasps are nearly impregnable, with a very dense exoskeleton that deflects the bites and stings of host wasps. Cuckoo wasps can roll into a ball to further protect themselves. A less common parasitic wasp also came to the wall. Leucospis affinis is a large chalcidoid wasp. 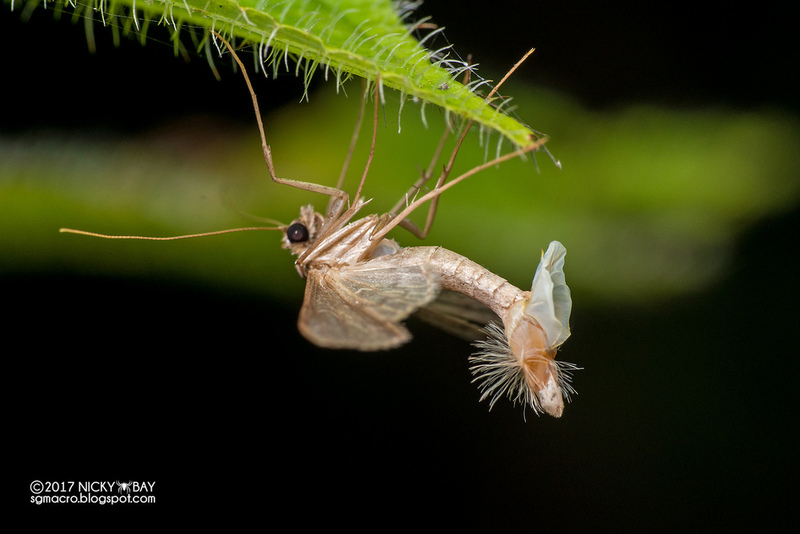 The female is easily recognized by the whip-like ovipositor that curls over the top of her abdomen. The ovipositor is the organ she uses to lay her eggs....by drilling through the solid wood directly into one of the cells of her host. How she divines the location of a host larva through a layer of dense cellulose is a mystery to me, but her aim is usually true. A completed nest of a mason wasp is usually identified by the mud plug that closes the entrance to the hole in the wall. Because the soil at Cape May is essentially all sand, it was difficult to tell if we were looking at a sand closure or a sawdust closure that would be the work of one of the carpenter bees. 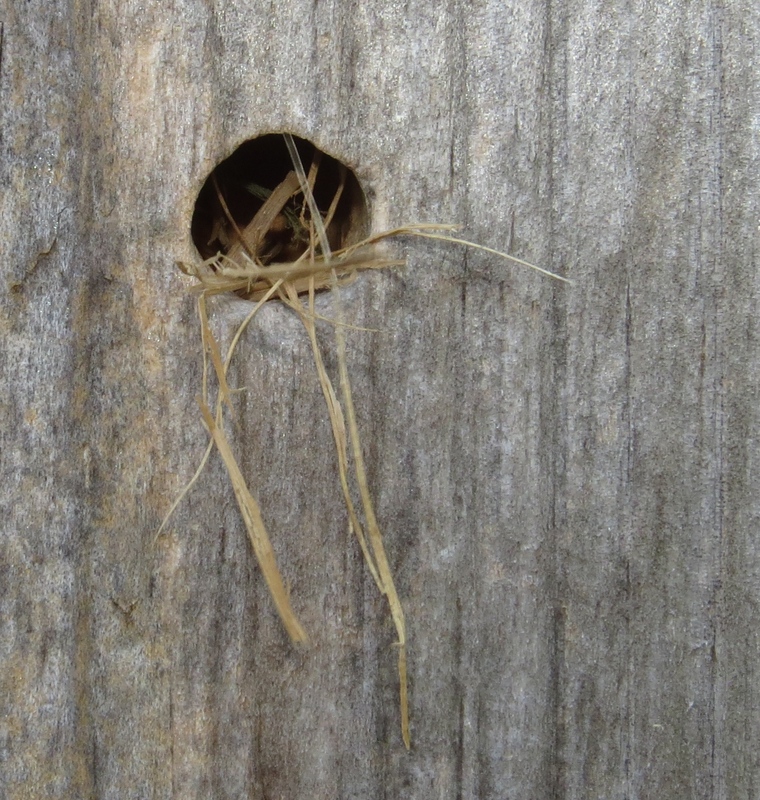 Nest closure of leafcutter bee, Megachile sp. Easier to identify was the completed nest of a leafcutter bee, genus Megachile. 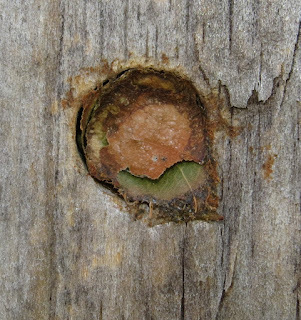 Leafcutter bees snip oval pieces from leaves of living plants and fashion those clippings into barrel-shaped cells that they stack along the length of a tunnel in wood, or underground in the case of a few species. The female bee then cuts at least one perfectly circular leaf fragment that serves as a "lid" for the completed cell. 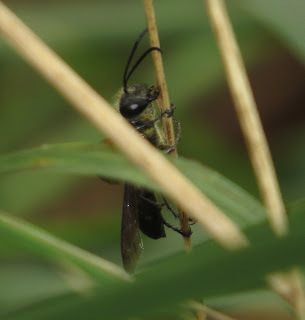 Nest of grass-carrier wasp, Isodontia sp. We found one hole filled loosely with bits of grass, and we surmise this was the work of yet another kind of wasp, the grass-carrier. 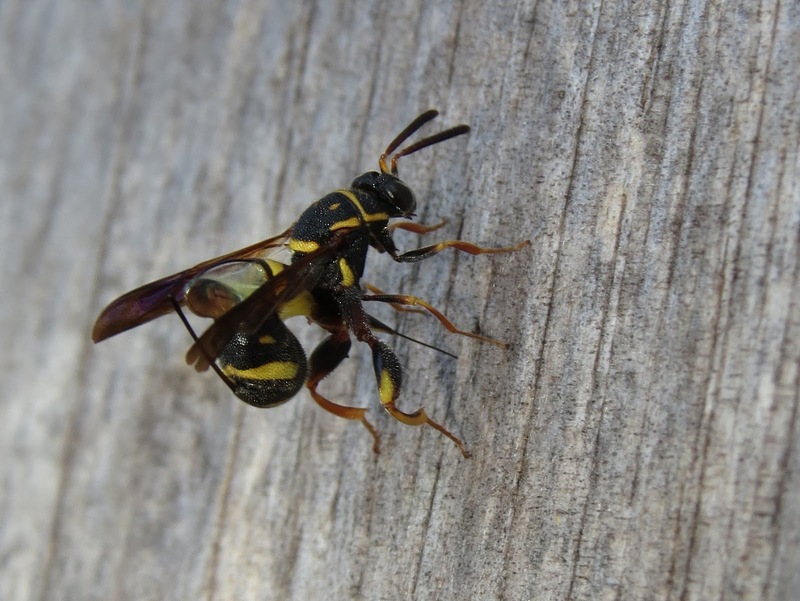 These solitary wasps, related to mud daubers in the family Sphecidae, use dry grass to fill, and/or partition, and plug their nest tunnels. Near Cape May Point State Park we did witness a female Isodontia mexicana select and bite off a dry grass stem to take back to her nest, so we know these insects were active. Ironically, one other kind of wasp was tearing the wall down one mouthful at a time. Workers of the Bald-faced Hornet, Dolichovespula maculata, would alight on the wall and begin chewing off wood fibers to mix with their own saliva. This creates a pulp that they use to make durable paper nests. 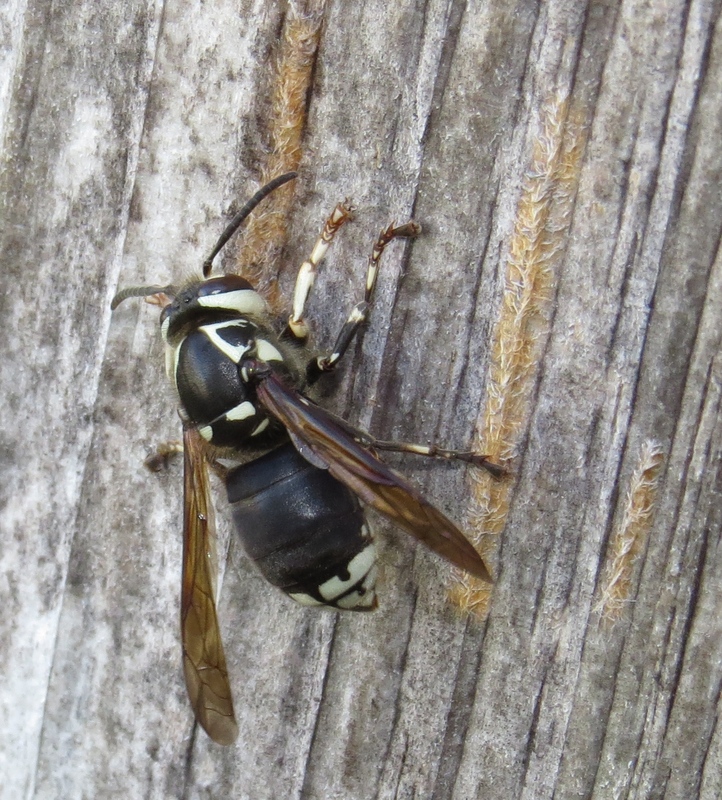 Looking more closely at the wall we realized that the scores of yellow streaks on the otherwise weathered gray wooden surface were where yellowjackets (of which the Bald-faced "Hornet" is just another species) had stripped fibers for use in building their nests. No doubt, earlier in the season there would be even more activity around this wall. The shed is still standing, sturdy as ever, so the insects are not doing much, if any, structural damage. 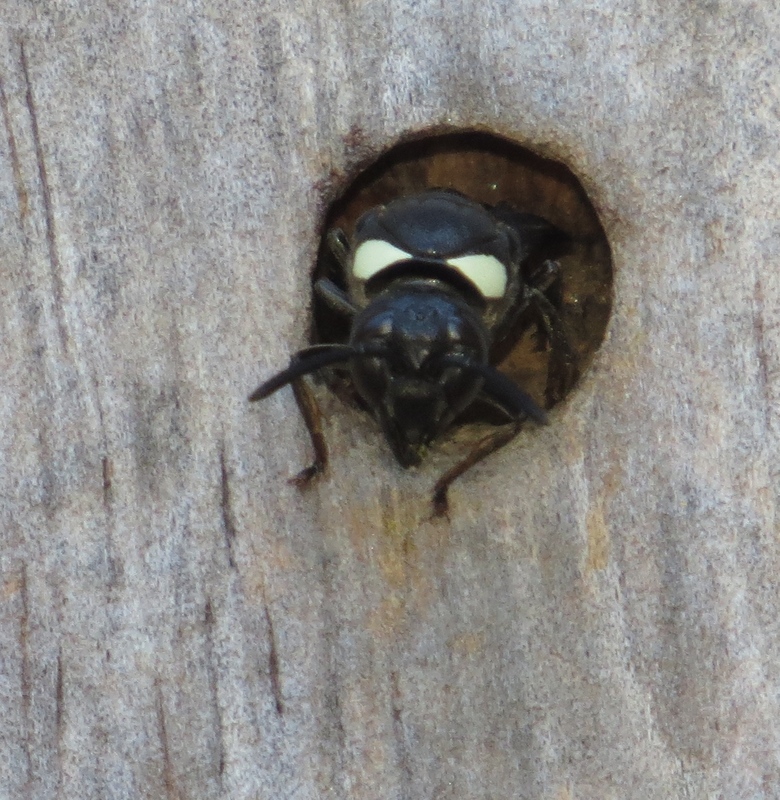 Please consider that if you find that your own shed is becoming home to carpenter bees and other insects. You may find yourself as enthralled as we were by the little ecosystem started by carpenter bees. Sources: Evans, Howard E. 1963. Wasp Farm. 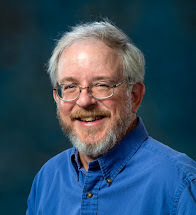 Ithaca, NY: Comstock Publishing Associates (Cornell University Press). 178 pp. Buck, Matthias, Stephen A. Marshall, and David K.B. Cheung. 2008. “Identification Atlas of the Vespidae (Hymenoptera, Aculeata) of the northeastern Nearctic region,” Canadian Journal of Arthropod Identification No. 5: 492 pp. (PDF version). Krombein, Karl V., et al. 1979. Catalog of Hymenoptera in America North of Mexico Vol.2 Apocrita (Aculeata). Washington, DC: Smithsonian Institution Press. Pp. 1199-2209.